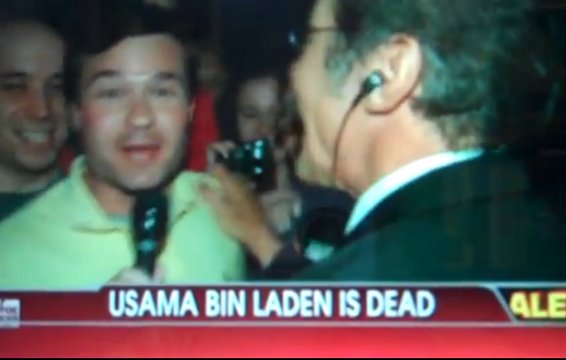 “And War Eagle!”: A still from video of Fox News’ coverage of Osama Bin Laden’s death. Turns out the rosy-cheeked Auburn fan who ended a raucous man-on-the-street interview with Fox News’s Geraldo Rivera last night with a “War Eagle” is a former Auburn SGA Vice President. Brad Buck, a Birmingham lawyer, was on vacation in Washington D.C., eating a late dinner with friends in Arlington, Va. when he received a text message telling him to turn on the news. Buck’s group happened to walk past the Fox News anchor as he walking out of a gate by Pebble Beach, the area of the White House’s north lawn where television correspondents do their stand-up shots. He was looking for people to interview. “I was just trying to stand there behind him in the background, but I made my mind up — if he puts the mic in front of me for comments, I’ll give a ‘War Eagle’, otherwise I’ll just be a spectator,” Buck said. After talking to some Canadian dude, Geraldo found Buck. His cell phone “started blowing up” immediately afterward, he said. Buck graduated from Auburn in 2002 and served as SGA Vice President in 2000. He lived in D.C. for two years after college and served as press secretary for Congress Robert Aderholdt (R-AL) before returning to Alabama to get his law degree at the University of Alabama. Buck continued his vacation in New York City today and plans to visit Ground Zero on Wednesday.